Today I was lucky to find a mother and her young joey still in the pouch. They were enjoying the native shrubs and plants that were growing in the eastern side of town today. These kangaroos live in the rocky escarpments around town, and come with the common name Wallaroo. Previously they were called Euros, but the term has fallen out of common use. They are not quite a wallaby as they have a continuous S-shaped spine, where wallabies have a joint near the bottom of their tail, allowing them to sit upright. However, when seen from the rear side on they are incredibly robust, built to hop around the mountainsides. This little joey will be big enough to start hopping around soon. 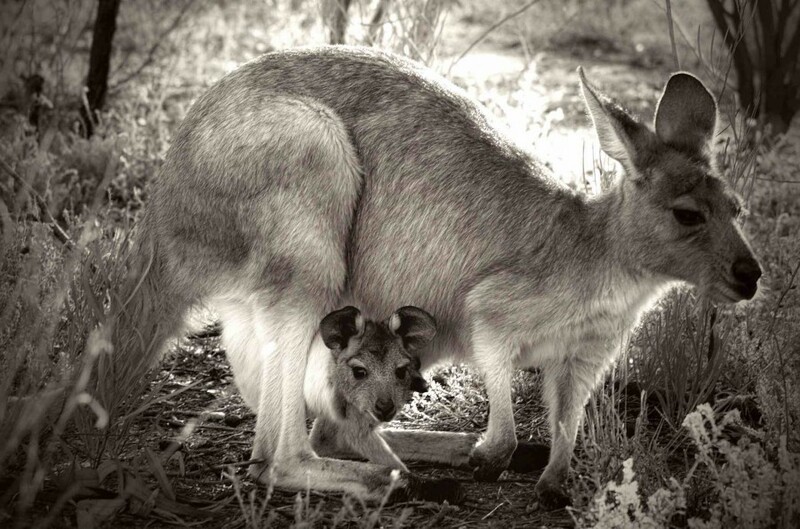 For many, the sight of an animal with a pouch to carry its young will be incredibly interesting. It is already a favourite of mine.